Alex Camarda, of Reinvent Albany, displays a chart listing potential reforms to clean up state government. 2018 will be a year of criminal trials for former associates of Governor Cuomo, as well as the former leaders of the legislature. Reform groups say they hope the lengthy court proceedings will spur lawmakers to enact some ethics reforms. Six continuous months of corruption trials kick off on January 22nd, when Cuomo’s former top aide Joe Percoco faces bribery charges for allegedly soliciting over $300,000 from companies doing business with the state. 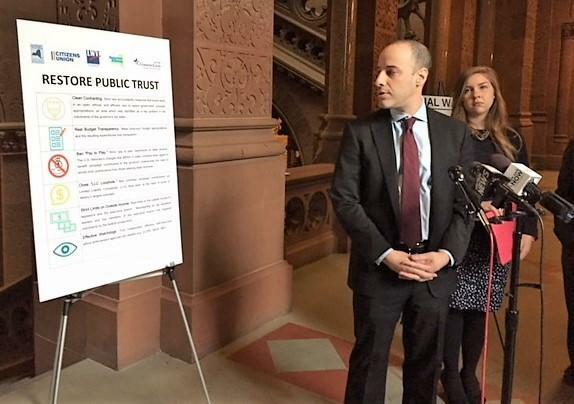 Blair Horner, with the New York Public Interest Research Group, says it will be a year unlike any other. “Every month, from January through June, we expect there to be a high profile case commencing,” Horner said. In February, former State Senator George Maziarz goes on trial. In March it’s the former Nassau County Executive. In April and June, the former legislative leaders Sheldon Silver and Dean Skelos face retrial on corruption charges. And in May, the former head of SUNY Polytechnic Institute, Alain Kaloyeros, will be tried for allegedly conducting kickback and bid rigging schemes related to economic development contracts between SUNY Poly and state contractors. Hear the story from Capital Correspondent Karen DeWitt. Horner says all those accused are innocent until proven guilty, and all could be exonerated. But he says if past corruption trials are any indication, there will be plenty of unsavory testimony about the inner workings of government. “It will paint a negative picture of politics in New York in terms of the revelations that will come out in these cases,” said Horner. He compares it to the so called bridge gate trial in New Jersey. New Jersey Governor Chris Christie was not charged with any wrong doing in connection with a scheme by his administration to close lanes on the George Washington Bridge in order to punish a local mayor. But Christie’s popularity declined after the trial, and he did not seek re election. Governor Cuomo also has not been implicated in any of the crimes that his former top aide and former associates are accused of committing. Alex Camarda, with the reform group Reinvent Albany, says there’s already been some response from lawmakers. He says he’s heartened by statements from the Senate Republican Majority Leader, John Flanagan, who says he wants to closely reexamine all economic development contracts. Camarda’s group wants to reinstate the State Comptroller’s oversight authority over state contracts. That power was removed by the governor and the legislature several years ago. They’d also like to create a public data base of all deals struck between the state and private contractors. Cuomo proposed several reforms in the 370 page booklet that accompanied his State of the State speech. They include adoption of early voting in New York, same day voter registration, public financing of campaigns, and constitutional amendments to impose term limits on elected officials. He also backs a constitutional amendment to limit outside income for legislators and change the legislature from part time to full time. “Let legislators say, ‘I work for the public. Period. And there are no conflicts presented’,” the governor said. The proposal drew little enthusiasm from Senators and Assemblymembers at the speech, and many did not applaud. Jennifer Wilson, with the League of Women Voters, says while she’s pleased with the recommendations, she’s disappointed that Cuomo did not spend more time actually outlining the proposals in his speech. The governor talked about reform for around one and a half minutes, out of a 90 minute address. Other reform proposals from the governor are similar to ones he introduced last year, which were rejected by the legislature. They include giving his own Inspector General more power to investigate accusations of corruption and fraud within the SUNY system. The governor would also create a new chief procurement officer to better scrutinize all state contracts with businesses to make sure no corruption is occurring. Horner, with NYPIRG, says reintroducing the measures may not be such a bad thing. “Like a fine wine, some of these proposals need aging," said Horner, who describes himself as “an eternal optimist”. “And that this year is the year when we pop the cork,” he said. Horner and the others say they would prefer, though, to have independent oversight of state contracts, not a body that’s controlled by the legislature or anyone else in government. 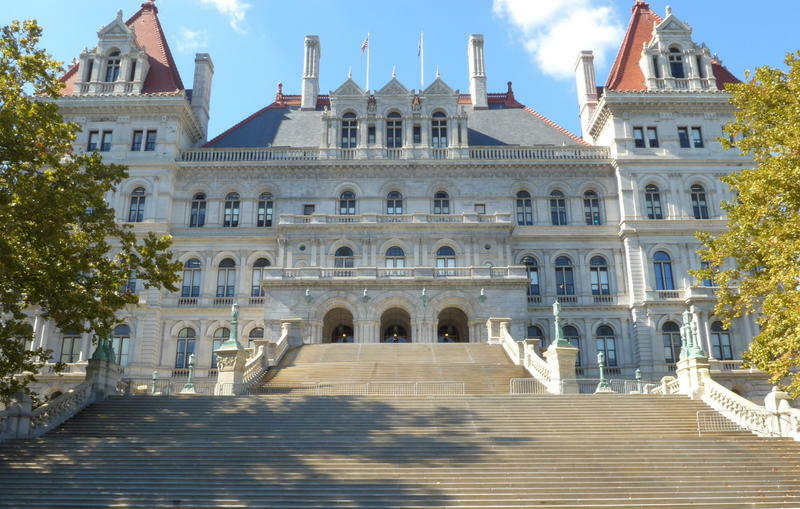 When the legislative session ended on June 21st , lawmakers left behind a lot of unfinished business, including a failure to act on ethics reform proposals in light of an economic development scandal in the Cuomo Administration.